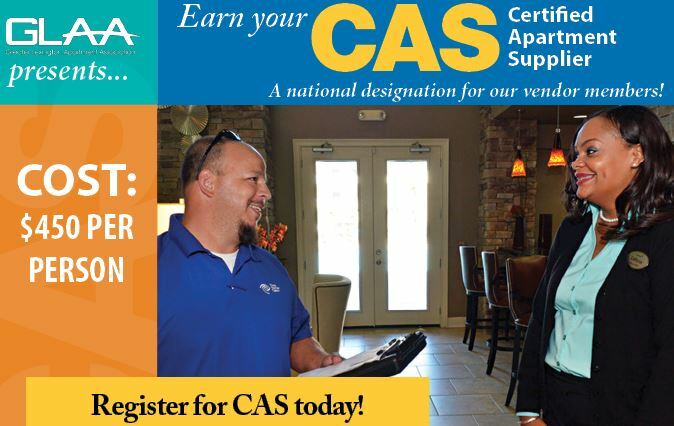 Earn your Certified Apartment Supplier designation and enhance your sales skills as well as your customer relationships. There is an old saying, “You can’t really understand another person’s experience until you’ve walked a mile in their shoes.” The CAS program helps you understand the everyday challenges faced by community managers and their companies. At the conclusion of this program, you will be better able to position your products and services to meet the many needs of community managers. This program will also help you make the leap from supplier to trusted partner. Earn your CAS designation and enhance your sales skills as well as your customer relationships. Cost includes: Materials for the course, Exam fees and lunch on some of the days of instruction. Also, the Supplier Success Course fees. *Held at GLAA Office with the Certified Apartment Manager designation course! Dates in May & June TBA. The class will take place in conjunction with CAM class, which means that your peers will be managers in the apartment industry. The Supplier Success Course must also be completed to earn your CAS Designation. Your enrollment fees of $450 includes both the CAS Modules - books & exam fees- and the Supplier Success Course to be completed in September.